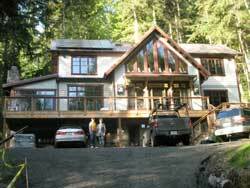 This website describes the construction of our new home on five forested acres adjacent to the community of Indianola, on the Kitsap Peninsula in the Puget Sound Basin of Washington State. The home incorporates principles of sustainable design as presented in the "LEED for Homes" certification program of the US Green Building Council. LEED -- Leadership in Energy and Environmental Design -- considers not just the sustainability of the building materials, but the overall design of the system that makes up the house. LEED also emphasizes sustainable construction process, the location where the home is built, its durability, and its healthfulness for the people who live in it. We hope to show that a home can be earth-friendly while still being comfortable and built within a budget.